Additonally, a “Klipsch Bohemian Rhapsody Sweepstakes” will be held from February 1 – March 31, 2019 in the United States. Entrants have the chance to win a prize package that includes an award-winning Klipsch Reference 7.2.4 Dolby Atmos Home Theater Speaker System, a copy of Bohemian Rhapsody on Blu-ray™, a Bohemian Rhapsody luggage tag, cap, tee shirt, USB, and gold backpack (valued at $4097 US MSRP). Bohemian Rhapsody is available now on Digital and available on Blu-ray™, DVD, and 4K Ultra HD™ on February 12. The 4K Ultra HD ™ features immersive Dolby Atmos®, making sound come alive from all directions, including overhead, to fill a home theater with astonishing clarity, detail, and depth. Released by Twentieth Century Fox, Bohemian Rhapsody is a 2018 biographical film about the British rock band Queen. It follows singer Freddie Mercury's life from first joining the band in 1970 to their pivotal Live Aid performance at Wembley Stadium in 1985. Rated PG-13. Bohemian Rhapsody was a massive box office success, becoming the eighth-highest-grossing film of 2018 worldwide and the highest-grossing music biographical film of all time. The film has garnered tremendous praise garnering five Academy Award® nominations, including Best Picture and Best Actor for Rami Malek’s portrayal of Freddie Mercury, and winning two Golden Globes® including Best Motion Picture – Drama and Best Actor in a motion picture (Drama). 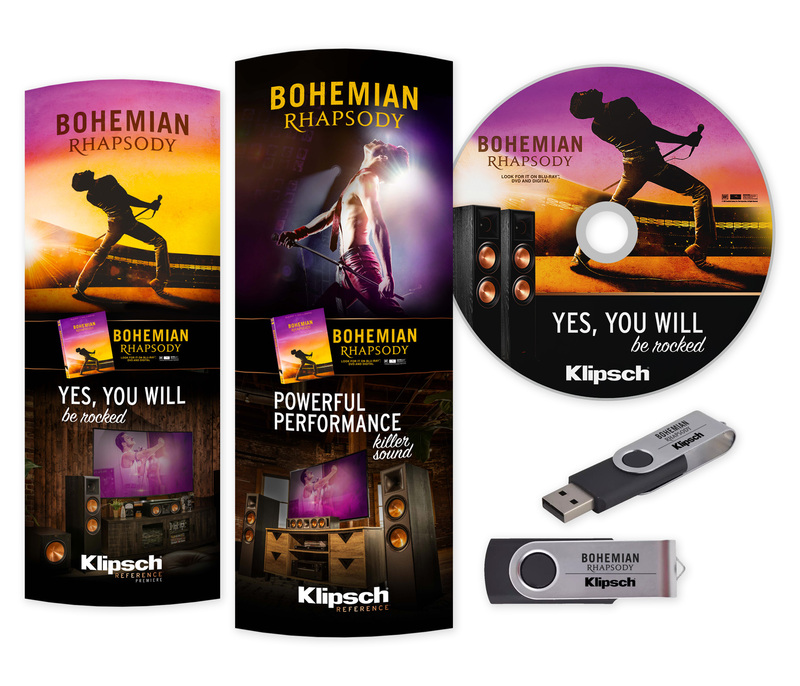 To learn more about the Klipsch and Bohemian Rhapsody promotion or sweepstakes, visit www.klipsch.com/bohemian-rhapsody.com. Klipsch®, Keepers of the Sound® are registered trademarks of Klipsch Group, Inc., registered in the U.S. and other countries. Klipsch Group, Inc. is a VOXX International Company (NASDAQ: VOXX).